This stunning card shape will be sure to bloom on any occasion and with our free template, it couldn’t be easier! 1. Print the free 3D flower card shape template and cut it out. 2. Draw around each part of the template on a different coloured Dovecraft 6x6 card blank and cut out. 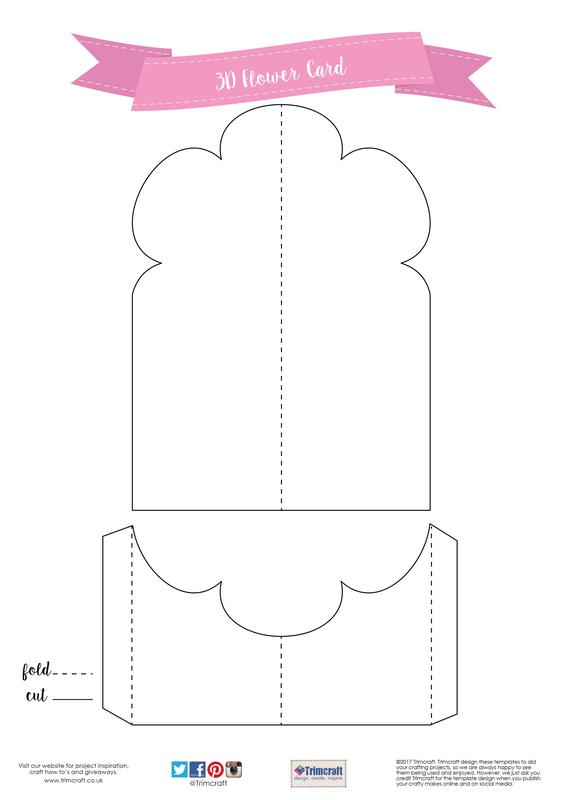 Fold and score where shown on your printable and adhere the two pieces together at the sides with Dovecraft Perma Fix Tape. 3. Cut a strip from the excess card blank used for the bottom of your card. Along the top, cut a fringed line to create the look of grass. Stick it to the bottom of the card with Dovecraft Perma Fix Tape. 4. Die cut 3 of each flower design from the Dovecraft Blooming Lovely die set. Adhere the heart from one of the flower dies to the centre each flower die cut, using 3D foam pads. Adhere the finished flowers to the left hand side of the card with 3D foam pads. TIP – save the flowers you have not used to embellish another card. 5. Die cut 3 of the rabbits from the Blooming Lovely Die Set, adhere one on the inside of the card and two on the outside. Add a Blooming Lovely bow to each of the rabbits on the front of the card. 6. 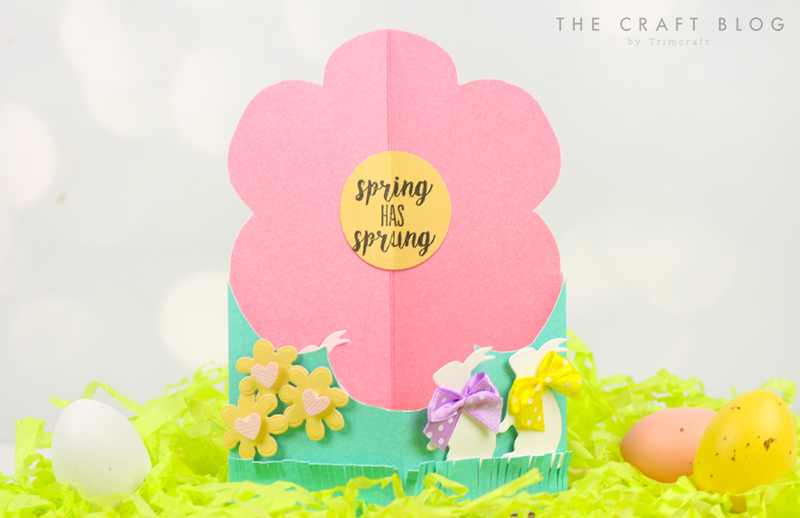 Punch a circle of card, fold in half vertically, open out and stamp the Blooming Lovely ‘Spring has Sprung’ sentiment onto it. Glue to the centre of the card to finish, ensuring the fold of the stamped sentiment lines up with the fold on the card. How will you use this gorgeous card shape? We would love to see so make sure to share your projects in the inspiration area and to #Trimcraft when uploading to social media.